Paul Draper’s return to the music making fray has been nothing short of triumphant. As readers of Prog will be all too aware, Draper had many reasons to keep away – among them, the collapse of his band Mansun – but something drew him back, and the fans, who turned his debut album Spooky Action into a Top 20 hit and this first solo tour into a sell-out, couldn’t be happier. It’s not just 90s nostalgia propelling Draper’s second wave of success. There’s a nervy intelligence to his latest music that makes it more than a match for Mansun’s Attack Of The Grey Lantern and the still-amazing Six. It wouldn’t be too much of a stretch to describe Spooky Action as Bowie-esque: it’s suffused with some of the dread of Low and Heroes, which were recorded at the height of the Cold War. Indeed, hanging ominously over tonight’s gig is the spectre of a new geopolitical standoff, between the US and North Korea, for that extra vivid frisson of relevancy and terror. Taut, tight, tense – the music, and the nuclear deadlock. 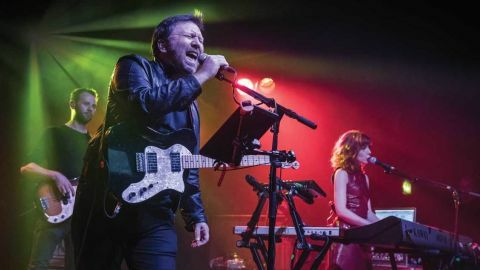 Then there’s Draper’s collaborator Catherine AD, aka The Anchoress, on keyboards and backing harmonies stage right – a phantasmic presence, somehow barely there and incognito, yet crucial. Long-term Draper/Mansun buffs will know of his history of hiding some of his best material on single and EP B-sides, and in a nod to this, he opens with three such tracks: The Silence Is Deafening from 2016’s EP One, Don’t You Wait, It Might Never Come from EP Two, and No Ideas, also from EP One. Draper could easily have made this a night of looking back, but instead he ploughs forward with new material, via the powerful, percussive Feeling My Heart Run Slow. He smiles a lot, and there’s plenty of between song banter, suggesting an alternative career as a northern stand-up comic: Draper is clearly relishing his second chance. He even conducts the audience in a singalong of Things People Want. The first Mansun track doesn’t come till halfway through, and it’s Disgusting, which comes in deconstructed, acoustic form as a smouldering ballad, a style at odds with the lacerating lyrics. He introduces his excellent band ahead of Friends Make The Worst Enemies, while Grey House has a resonant rumble. And Who’s Wearing The Trousers precedes two final Mansun songs, namely I Can Only Disappoint U and a magnificent encore of Wide Open Space. But as though to confirm what Draper is about, he closes with Don’t Poke The Bear, the most prog piece on Spooky Action – imagine some exceptional cross between Radiohead and John Barry. It augurs well for the future – which, after all, is where Draper belongs.